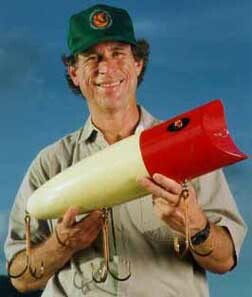 I began making my Giant Lure Sculptures in 1995 as a joke for a fishing trip with friends. The giant lures struck a chord with many folks and I soon found myself working full time to meet the orders of galleries and individual customers. My lure sculptures are often modeled from the classic wooden plugs I grew up using. I love to fish and grew up fishing the canals and bayous surrounded by giant cypress trees in Southeast Louisiana. All of my work starts with rough kiln dried cypress. Depending on the lure it may be turned on the lathe or sawn out on the bandsaw and then shaped. The lure is then primed, painted, and varnished. Metal hardware is attached and the lure is balanced to hang nicely from a single point. Many of my Giant Lure Sculptures are modeled from the classic wooden plugs I grew up fishing with. Others are modern lures that I now fish with or lures which have some quality that I admire. I sculpt my lures from native southern cypress. Each is carefully balanced to hang from a single point and turn easily in the slightest breeze. They are very realistic in both form and finish. And the hooks are real hooks. Someone once described my work as art that makes you laugh. Others see a giant lure and remember the time spent fishing with his father or grandfather. My sculptures are carried in top galleries across the United States and have been featured in both Fine Wood Working Magazine and Craft Magazine.